How to use an early access Google Fonts ( like Chinese, Japanese, Korean ) in WordPress ? Some Google Fonts have not yet graduated to be included in the Google Fonts Directory but you can use them and provide a feedback to Google if they need improvements. Those fonts are called Early Access Google Fonts. You can find the list here. Those early access fonts can be interesting to find beautiful typographies in Japanese, Chinese or Korean. But there are also many other typographies available. How to embed the font on your WordPress website ? The easiest way is to use the Custom CSS field in the live customizer. For example, let's say you need to use the font cwTeXYen (Chinese Traditional) on your website. Hit save and publish. You're done. What can I do if the font is not taken into account ? If the font is still not displayed on your website, it can be because another font is applied in priority ( learn more about the css specificity concept here ). 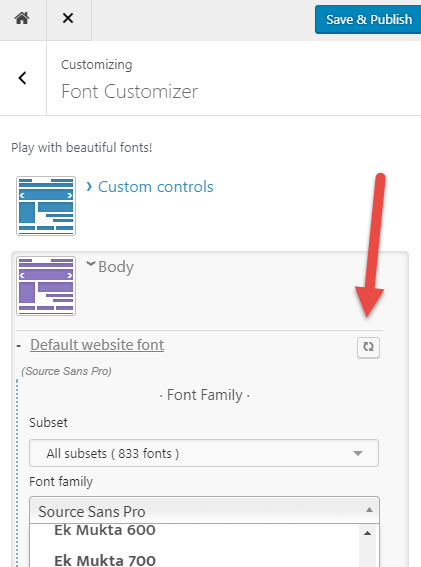 If you are a lucky user of the Customizr Pro theme of the Hueman Pro theme, then you'll need to reset the fonts previously customized with the reset button ( see the image below ).